Imagine, you are driving your car on a bright sunny day and after some time you step outside to run few errands. When you come back, you get to know that you have dropped your keys on your way back. Now you scout the area, go back and forth to look for your lost keys while your Volvo stands under the sun waiting to be moved. The first thing would be to stay calm and do not panic. Just accept the fact that you have lost your car keys and you now need to concentrate on getting a Volvo key Fob replacement. In this article, we will discuss in detail what you can do if you have lost your Volvo car keys. Anyone of the below-mentioned people, who have also Anyone of the below-mentioned people, who have been ‘been there’, should join the club. The first option would be to go back to your car dealer to get a valve key replacement, but we do not think it is a good idea. Primarily, it will be a lengthy process and second, it can be quite expensive. Therefore, you need to look for an expedient and reliable platform that you can trust not just today, but in future as well. That is where our company is going to provide you with the help you need. Here, at Locksmith Monkey, we are going to make sure that you get your Volvo car keys made and that too, in a short time. Our Volvo car key experts will help you in everything you need and will be at your disposal anytime you require. When this car was manufactured, the keys were designed in a way that these did not need any programming. As time passed, technology evolved and so did Volvo keys. Now, the latest models are built on high tech programming, like the Volvo’s four-track high-security keys. The newest Volvo models have utilized an FOB system that is especially designed to prevent intruders from unlocking your car. The FOB keys are also hard to cut; therefore, in case, it is broken, you cannot use a different key. In order to prevent yourself from any future inconvenience, you should get duplicated car keys as well. Once you have back up, you will be less worried and comfortably continue rest of your day. You just have to keep in mind that you need qualified car key personnel to muster a duplicate key for you. Once you have obtained it, you need to check whether it is programmed well to work with your car or there is some glitch. Our specialized and license key technicians well design top of the line duplicate chips keys. Therefore, in case, you decide to choose us, you will make a safe choice. Our highly proficient trainers will firstly dismantle the lock and then design a replacement. Even if you have a spare key, we will cut a replacement for it. We aim at facilitating our clients with long-term solutions, therefore, we will program the new key in a way that it works in proper alignment with the immobilizer as well. Now, you will find many locksmith companies in Portland that will assure you that you will get the best from a whole lot. However, before you choose, you need to confirm that the company is reliable. We can assure you that you can trust us whenever there is an emergency or you just need spare keys set. In case, you entail immediate service you can contact our technicians and your keys will be replaced or repaired within hours. We will design any key of any model at anytime of the day. All we require is the 17-digit VIN number and you can leave rest of the work to us. From as low as $24.99 you will get top quality car key services. In case, there is a security concern, you will get your car keys replaced immediately. Furthermore, your old FOB will no longer be operative once you start using the new one. By any chance, if you need old designed keys made, we can do that for you as well. If your car door got jammed or you need your Volvo Key Fob Replacement, then stop looking around and give us a call. We are a company that has solutions for your every issue related to your car. You can even get your lost Volvo keys made in just a few hours. Not only general car keys replacement, but we also provide services on transponder car key replacement. Additionally, we also have expertise in keys areas like broken car key extraction. The Volvo owners can also get Volvo duplicate chip keys from us at cost-effective prices. 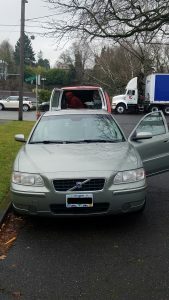 In case, you would like to know more, you can always contact us at 503-465-4595 for Volvo Key Fob Replacement. Lost Your Car Keys? No Problem! Sometimes you only realize the importance of your Volvo car keys once you unexpectedly lose them. A car key is your only way in and out of a car and therefore, you need to keep it safe at all cost. However, there will be many times when you might lose it or even break it while opening the car. In cases like these, there is no need to be hard on yourself. You just need to inform Locksmith Monkey and we will help you right at the moment.